I am a bit behind showing off some swaps that I have done recently. I did a swap with Simon (PaperCurious) a while ago. He posted our swapped goods over at his blog so you can see pictures here: papercurious.blogspot.com. He sent me a bank note notebook and some really fabulous handmade papers that he made, as well as a set of boards for me to work with! While I was at PBI last month I made my very first wooden book, so now I have no reason to be hesitant about using these boards from Simon. I'll be sure to show photos of whatever happens with those boards! Also, to follow up on my very last post where I showed the book that I made for the Book Arts Forum swap, this is the book I got in return. Fun, eh?! This garden journal was made by Peter Zillig (Vuscor). Unusual material, indeed! 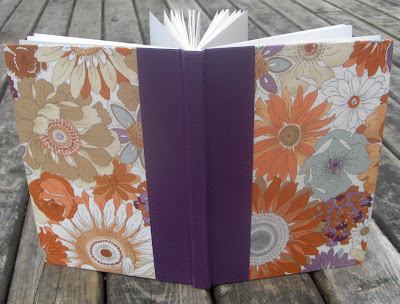 The album itself is wonderfully made with a colourful spine created by using multi-coloured spacers between the pages. Then to top if off, the fake gardens certainly add an element of whimsy and surprise. Thank you Peter! One more! The Bookbinding Etsy Street Team just completed another book swap and I got this wonderful casebound journal from Celine, at AlternativeJournals. It is a perfect combination of fabrics and colours. You can check out the rest of the BEST swap books on the team's blog. Wow! How totally cool. Just found your blog and am loving it! Gonna carry the laptop down to the couch and savor all the goodies. Sounds like some AWESOME things you're doing. Color me inspired. Happy day and thanks! 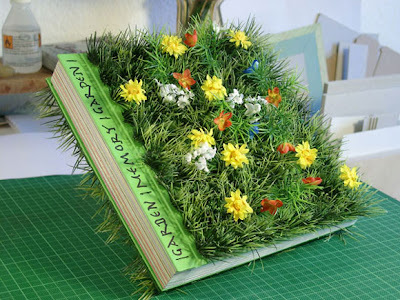 That is an amazing garden book.